Home / Manufacturers / Bradley Smokers Stoves Latest Projects NEW! 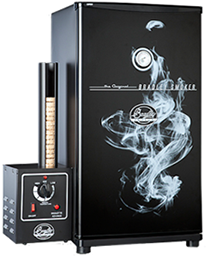 Developed in British Columbia, Canada, to provide an efficient and automatic way to smoke the salmon that are common in that part of the world, the Bradley Smoker removes the tedious procedures of smoking your own foods and gives everyone the opportunity to smoke to their own gourmet standard. The complete solution for anyone who wants to smoke their own foods, from fish and meat to vegetables (check out Bradley Smoker's own recipe for Smoked Butternut Squash Risotto). The automated smoking mechanism burns bisquettes at a regular rate, ensuring a perfectly even smoking process without needing to be constantly tended.